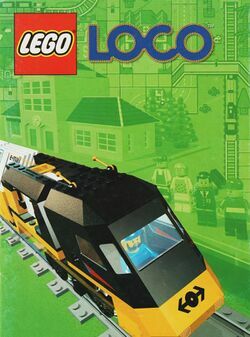 LEGO Loco is a Lego-branded children's game for the Microsoft Windows platform. It is a simple open-ended construction game with a slight emphasis on Rail Transport. The aim of the game is to construct a town in which Lego people can live. The game lacks any real challenge (there being no construction costs, no running costs, and no budget in general). That, coupled with its very colourful graphics, help to designate its target audience, which are children aged between 6 and 12. The game is LAN networkable over TCP/IP LAN, TCP/IP internet and IPX. At the beginning of the game, the player has a "Toy Box", in which he/she can select buildings from its lists and place them directly into the space provided. The player can put down roads, railway lines, stations, crossings, buildings and scenery. To start the simulation, the player must close the Toy Box and the town will come to life (though the player can open it again to make some changes, save the town, or open a new one). After a while Lego figures will begin moving into the houses provided (if any), and the player can, like with ordinary figures, pick them up and place them somewhere else. This can affect the figure's mood, depending on where it's placed. Also, using the train house, the player can create trains to run on the railway lines. If a train has passenger carriages it will stop at any stations that have been placed near a piece of rail track. The player can also control the train. Furthermore, the player can add on a mail carriage to the train, thus enabling it to carry postcards that have been created by the player. The train or trains can also go through these tunnels that the player can place at the edge of the map, and some tunnels can be used to help send and receive postcards (depending if a network has been set up or not). There are several easter eggs in the game, including the ability to breed animals in a field, the transformation of skyscrapers into giant robots, and even season-themed objects. The said objects will, however, only appear when the season is right (adjusted to the computer's clock). For example, giant eggs and tree blossoms will only appear around Easter; whereas presents, bells, and a plane flying by with a banner saying "Merry Christmas" will only appear in mid-December. There are also snow-covered versions of normal items.